Enjoy these lovely enhanced baby cards to celebrate the joy of a new arrival. Many of them can be used as thank you notes to friends and family and they can all be framed in a 5 x 7 framed as a gift for the nursery. 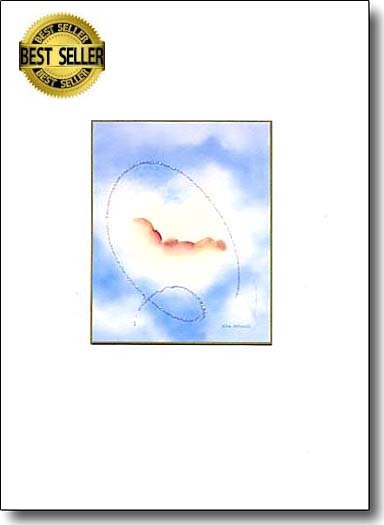 The Baby on a Cloud was one of my first cards and has been a best seller for many years. 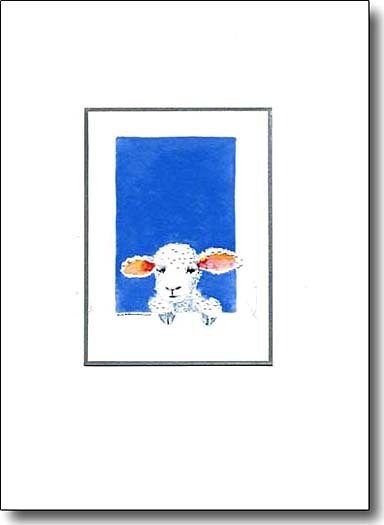 A lamb peeking through the window makes a perfect Thank You and newborn card. 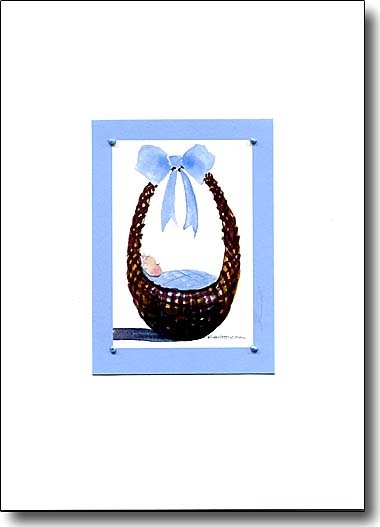 A tiny tot tucked into a sparkling rush basket that is decorated in a soft blue makes a perfect card for a newborn little boy. 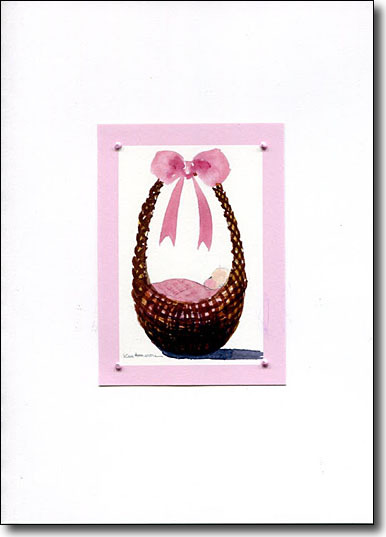 Moms and Dads will love this sweet newborn greeting card for a little girl. 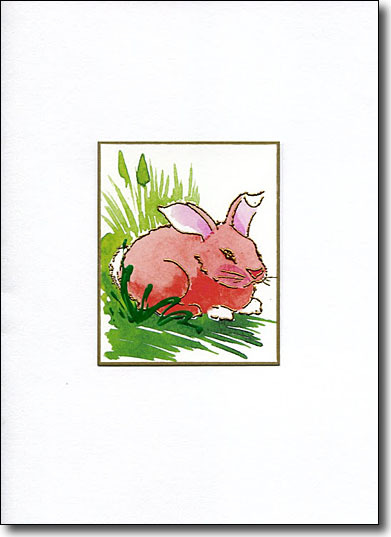 Use this snugly rabbit card at a baby shower. If you frame it in a standard 5x7 frame it will be a perfect nursery gift. 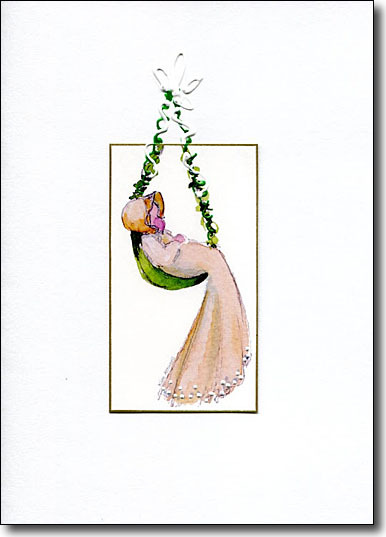 Ecru and lace decorate this spiritual greeting card. Christening the baby is a great occasion to send a fitting card. This newborn greeting card is imaginative in its design and is delightfully whimsical ...it's been my favorite for a long time. 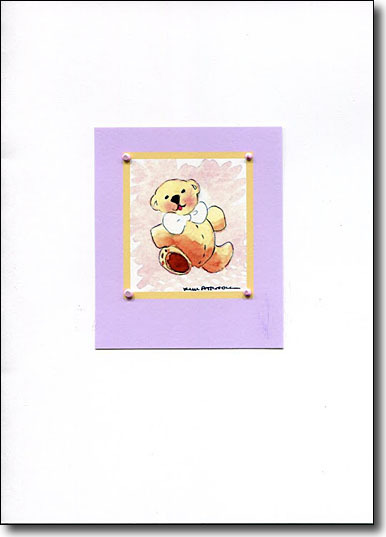 This plump Teddy in a pink frame is enhanced with raised pink paint and makes a darling card for a tiny girl. Little boys are the perfect recipients for my Teddy in Blue greeting card. These cards are perfect as thank you notes too. 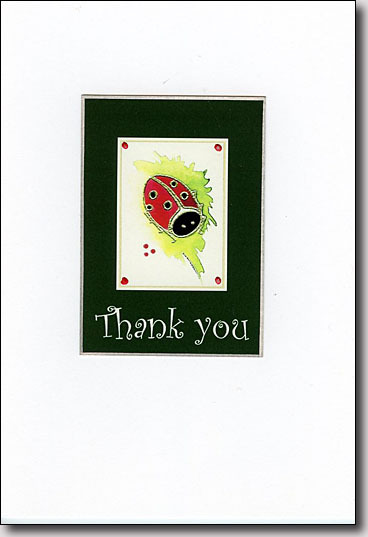 A cheerful, sparkly eyed Lady Bug is a lovely way to say thank you for the kindness shown by friends. 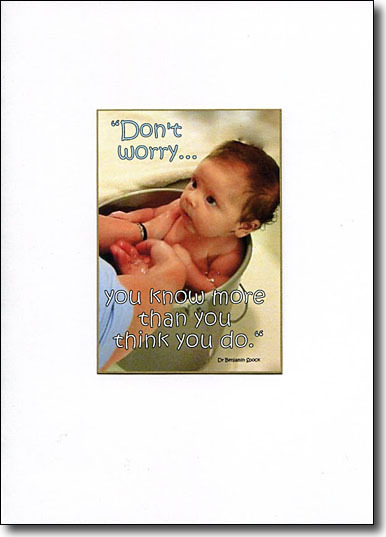 I love this quote from Dr. Benjamin Spock, "Don't worry, you know more than you think you do". To illustrate it with charm,I embellish this photo of my granddaughter in a bucket bath. Her expression is so trusting and babies do like bucket baths.